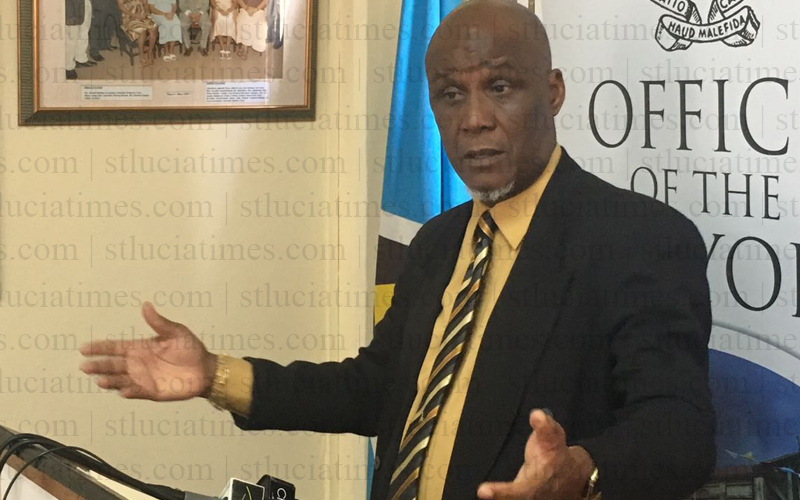 Asserting that the safety and security of locals and visitors in the City of Castries are his priorities, Mayor Peterson Francis has called on citizens to play their part in the fight against crime. Francis spoke against the backdrop of an attack Saturday in Castries on a Canadian couple who were visiting Saint Lucia for the first time. The Mayor said he sympathized with the tourists whom he disclosed had mistakenly ventured up Darling Road looking for a museum. But he lamented that Saint Lucians appear not to want to play their part in the society. “I have done it all the time. If I am driving up the Calvary – I am coming down the Darling and I see certain tourists walking up, I stop to inquire where they are going. Do they know where they are going? I tell them: ‘ No, come back.’ There are times I take them back myself in my vehicle to town,” the Castries Mayor told St Lucia Times. “We hope these things will stop because we are now putting (in place) what we call the City Tours. We want it to be organised so people will be able to go to different places – even people who want to shop and go to certain areas, so we will have these things,” he explained. Francis also said what bothers him is that there are periods of calm ‘for so long’ yet no one speaks about it. “We just had a meeting with the cruise ships. We just had a meeting at Bay Gardens and they complimented us about the fantastic job we are doing as far as the tourists are concerned,” the Mayor observed. “Sometimes I believe people look at Saint Lucia as the Garden of Eden. In other words, nothing must happen in this country. I am not condoning crime. But why don’t we concentrate on the positive? We have months – nothing is happening. We had a whole year where the cruise ships, all the people were happy; we did not have one incident – nothing reported. We did not dwell on that and try to build up our tourism industry,” he lamented. “But we are quick to now dwell on these negatives,” the Castries Mayor declared. For once I agree with the Mayor. It about recognizing that every country in the wold have their share of problems; there is nowhere that is crime free. However it is our responsibility as St Lucians to do within our ambit to prevent or crime and to be vigilant. Let us not paint this picture perfect image of Saint Lucia. We have a beautiful island but we also have disagreeable people here too (like everywhere else) who will step out of line and commit unsavory acts. The bottom line is that we still have one of most beautiful places known to foreigners. Like the mayor said, let us not dwell on the negatives…address them and revel in the positives that still makes St Lucia beautiful! So why convolute the Policing system with the City Police and RSPLF, why! I maybe wrong on this but is because of the Canadian tourists incident you felt the need to make the above hypocritical statement. How many times have you warned St Lucian youngsters or elders walking up or down the Darling! Where’s your sympathy for numerous locals who have been robed as of late – no statement no sympathy. Reading in between the lines of the gibberish you stated it’s purely because of the Tourist incident. In 2019 this is absolutely horrible and disrespectful to us the indigenous St Lucians. So very well said. Nothing to add. Here’s a simpler solution: Bulldoze Conway, Grass Street, Graveyard. Ask your self, how long will you people allow such elements to destroy our country. Whatever good that could’ve come from those areas is over. Now is only guns, theft, drugs, and negativity. St. Lucia is presently bedeviled with criminal activities and that’s an irrefutable fact. It is the most worrying preoccupation of most locals. How can one just sweep this under the rug ? How can any human being ignore or remain silent when there is a constant threat to his life and property? It’s unreasonable to ask people to just focus on all that is positive and be tight lipped about the daily shootings and robberies. I fervently agree with the Mayor that all St. Lucians should contribute to crime fighting. Give the police the relevant information if they happen to come across criminal activities. However, I intensely disagree with him on sweeping the blatant criminal happenings under the mat. I guess the Mayor feeling the heat of the many crimes occurring in and around Castries. This has punctured his insatiable ego of self adoration. St Lucia is beautiful. Watching the current cricket coverage from overseas one is reminded of just how beautiful it is, the lush rainforest and hills and those beaches. This coverage will no doubt entice new visitors to the island so please clean up the place, crack down of crime (especially now that the courts are open again), and make it safe – both for the locals and tourists. City tours sound like a good idea. I have read them all;; still no solution! The issue here not about Tourist going off the beaten track or Saint Lucian’s not asking tourist they see wondering off the beaten track. As far as I am concerned, anyone be it nationals or tourist have a right to visit/walk in any part of the country – except private property of course – and should be free from being victims of crime. IT IS CALLED FREEDOM TO ROAM….. This crime epidemic needs a national review as to how all concerned – and that is the entire nation – could work together to combat this crime menace. This issue does not emanate from the moment crime is committed but from the very germination of social issues starting at home, continued in schools then when perpetrators are fully grown adults, spill out in our society as crime and criminals. Therefore Mr Mayor, it is the government’s duty to nip this issue in the bud…a program of Education , health, jobs, National Citizen’s service and civic pride etc etc will go a long way in reducing this crime menace. It must start from the womb. It is not social engineering but the right of every citizen to be given the best chance to be an active contributor to the development of Saint Lucia.